Sonika Prasad (Surveen Chawla), the mistress of a powerful political leader Mandar Mhatre is found buried alive in a coffin. Then the story unfolds that she was tortured by Mandar and when she tried getting away from him to start a new life with the man she actually loved – Akshay (Jay Bhanushali) a�� it was a disaster. Akshay was killed by three of Mandar’s men, while Sonika survived. With dishonest cops and ruthless men hunting her, will Sonika be able to avenge her lover’s death? The trailer of the movie hit over seven million views . Holmes (Robert Downey Jr.) investigates a series of seemingly unrelated murders, terrorist attacks and business acquisitions across the world, which he feels is connected to Professor Moriarty (Jared Harris). On his first encounter with Moriarty, the master criminal threatens Holmes with the life of Watson (Jude Law) and his newly wedded wife (Kelly Reilly). Holmes even saves Watson and his wife from an attack planned by Moriarty. On learning a bomb has been planted in the Paris, Holmes and Watson head to Paris. It is the 12th highest-grossing film released in 2011 worldwide. Bridget (Blake Lively), Carmen (America Ferrera), Lena (Alexis Bledel) and Tibby (Amber Tamblyn), the four teenage girls from Bethesda, Maryland, were going to be separated for the first time because each had a different plan for the summer break. Though of different measurements when they find a pair of jeans that fits them all perfectly, they decide to be connected by those jeans and call it the travelling pants. Oddly enough the pants do play an important role in their holiday. The movie won America Ferrera the Imagen Foundation Awards for the Best Actress. Dark Elves attempt to send the universe into darkness, with the help of the weapon Aether, is thwarted by the warriors from Asgard, lead by Bor. The weapon is kept in a secret place. Malekith (Christopher Eccleston), the leader of Dark Elves escapes and is waiting for another opportunity to finish what he had started. Centuries later, Jane Foster (Natalie Portman), a scientist, discovers Aether accidently and the weapon possesses her. She forces Thor (Chris Hemsworth) to bring her to Asgard before Malekith and his men find her. The movie surpassed its prequel in collection within 19 days of its release. Peter Quill (Chris Pratt), the space adventurer is hunted by Ronan (Lee Pace), the villain after having stolen an orb coveted by the latter from Earth. 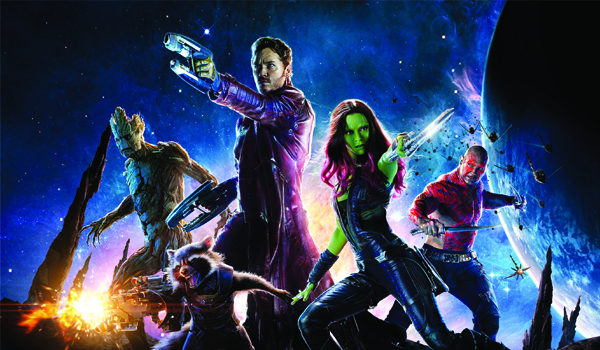 Quill creates a team, Guardians of the Galaxy, to save the galaxy from the wrath of Ronan and his men. The team tries to save and protect the orb from Ronan, who wants to sell it to make a lot of money. But to make matters worse the space pirate Yondu is after the orb too. It is the third highest-grossing film in the Marvel Cinematic Universe, behind The Avengers and Iron Man 3. Godzilla, Sunday, HBO, 9 pm. Fifteen years ago, there was a mysterious accident at the Janjira nuclear plant, which resulted in a formation of radiation eating organisms called MUTOs (Massive Unidentified Terrestrial Organism). Cut back to present and Joe Brody (who lost his wife Sandra to the accident) is arrested for trespassing in the accident area while he was investigating. Upon receiving his pictures, the US Navy learns about the MUTOs and assigns a team led by Ford Brody (Aaron Taylor-Johnson) to find the marauding creatures. Soon they realise that they have another prehistoric massive creature to tackle, the Godzilla, who is also out to destroy the MUTOs. The movie was released on the original film’s 60th anniversary. Hank Moody may have survived a murder suicide attempt by his lovelorn ex Carrie, but he still gets nightmares about her. In the latest episode of this comedy series, Charlie takes his best friend along with his star client to meet Atticus Fetch. A disclosure about Becca prompts a tailspin that causes Charlie, Karen and Marcy to take action with Hank. With Lucious (Terrence Howard) aiming to make Empire Entertainment a global music monolith, next he is looking to starting a partnership with Jago (guest star – Patrick Mulvey), the founder of a music streaming company. Meanwhile, Andre has to twist his newfound values to achieve a delicate balance between his faith and his career, Hakeem begins to work with Laura to turn her into a star and Cookie sets her sights on having Lyon Dynasty. A highly-acclaimed British fantasy show inspired by Greek Mythology, it is about a world set in an ancient world of legendary heroes and mythical creatures. Watch the premiere with three back-to-back episodes.